This fourth Variorum collection of articles by Peter Linehan comprises items largely from the past decade. The studies represent further investigation of themes broached in earlier works, in particular the latest report on the movements of Cardinal John of Abbeville, and the related subjects of historiography and historians, the interplay of history and government, and aspects of sacral monarchy. 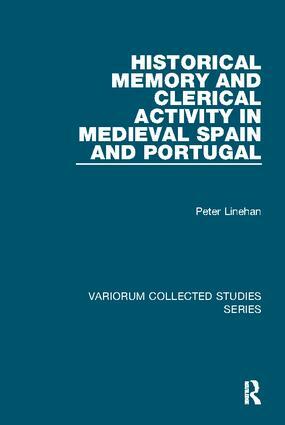 Articles on Zamora's frustrated legal history and Zamora's cardinal extend the Castilian theme across the territorial frontier into the kingdom of Portugal, and two other items explore English ramifications and developments in papal procedures. Contents: Preface; By way of introduction: the Spanish Middle Ages and the 19th century; A papal legation and its aftermath: Cardinal John of Abbeville in Spain and Portugal, 1228-1229; Dates and doubts about don Lucas; Don Rodrigo and the government of the kingdom; Don Juan de Soria: unas apostillas; Juan de Soria: the chancellor as chronicler; the case of the impugned chirograph and the juristic culture of early thirteenth-century Zamora; Columpna firmissima: D. Gil Torres, the cardinal of Zamora; La conquista de Sevilla y los historiadores; The king's touch and the dean's ministrations: aspects of sacral monarchy; "Quedam de quibus dubitans": on preaching the crusade in Alfonso X's Castile; The invention of Toledo; El cuatro de mayo de 1282; A misattributed tomb and its implications: Cardinal OrdoÃ±o Ãlvarez and his friends and relations (with M. Torres Sevilla); The English mission of Cardinal Petrus Hispanus, the Chronicle of Walter of Guisborough, and news from Castile at Carlisle (1307); Patronage and indebtedness: Portugal, Castile and the papal court around the year 1300; Fiat A; the earliest known roll of petitions signed by the pope (1307), with P.N.R. Zutshi); Index.